Prepare to turn night into day with the new Fenix TK75 2018 LED torch. 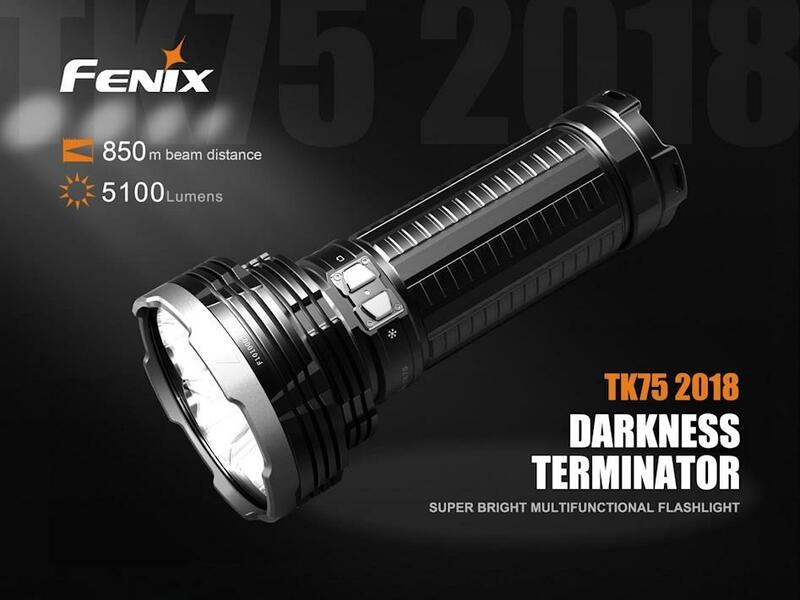 With lighting power increased from 4000 to 5100 lumens and beam distance increased from 650 to a stunning 850 metres the 2018 TK75 is an outstanding upgrade to the outgoing model. Four of the latest Cree XHP-35 HI LED’S, each mounted in its own reflector provide massive illumination and broad versatility with a choice of 6 brightness levels starting at 50 lumens. 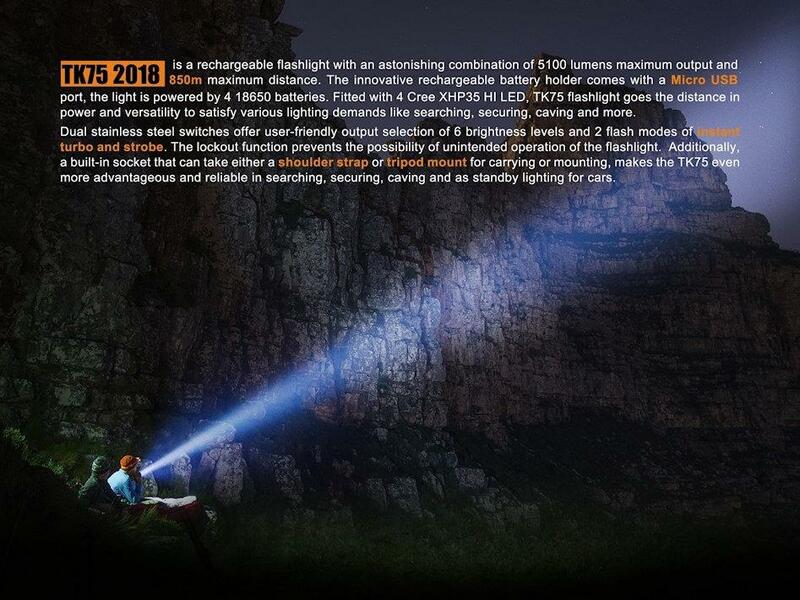 The versatile beam profile which features spot and floodlight simply illuminates everything from near to far. TK75 2018, like its forebear is powered by 4 x 18650 batteries (not supplied). 3500 mAh batteries are recommended for best performance. This new model offers the ability to charge all four cells in the battery carrier using an existing USB to micro USB (mobile phone etc) charger. This means that should you not have a separate charger with you the pack can still be charged. 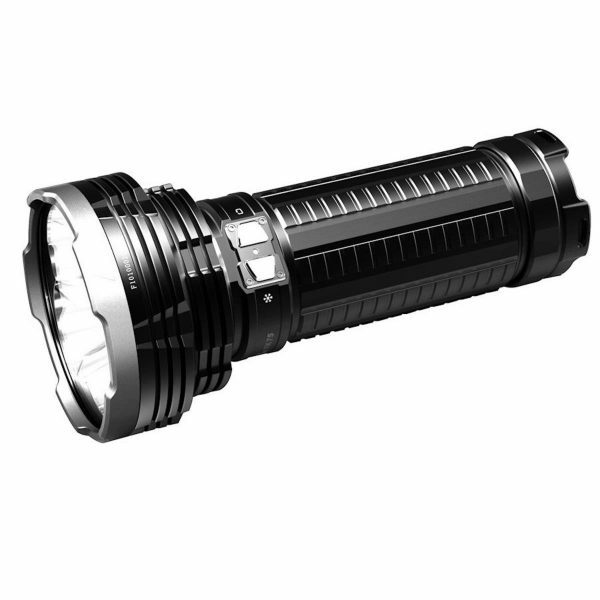 2 x 18650 or 4 / 8 x CR123 batteries can be used in an emergency but output will not be adjustable. Switching is controlled by 2 x Stainless Steel neck mounted buttons, the right button giving access to Instant Turbo and brightness adjustment, the left button accessing Instant Strobe and SOS functions. Buttons can be de-activated for safe transport simply by pressing both for 3 seconds. Repeat to re activate. * Compatible with Fenix AER-TK75 extender kit – double your run time!